Even if you’re well beyond the start-up phase, you’d have to have been tucked away in hibernation to have missed the lean business trends. Maybe you took note, or maybe you dismissed them as inapplicable. Either way, while these strategies might seem best suited for new or small companies, the truth is that companies of all sizes can benefit from adopting a lean mindset. When it comes to public relations (PR) specifically, companies would be wise to reevaluate their strategies through the lens of this approach. Here are some tips to do this. When a business reaches a level of maturity, it’s tempting to be lulled into a “more is better” belief. You have the personnel and the resources, so why not pump out as much content as you can? The problem with this is that strategy is nowhere in that line of reasoning. Without some thoughtfulness, content can fall flat or even cause damage to a brand. Instead of engaging in content initiatives for content’s sake, press pause and realign. Your new focal point should be on delivering value. Yes, of course you want to get something in return for your efforts. After all, content marketing results in three times as many leads as other types of marketing (but costs 62 percent less). So it’s clearly beneficial to you to get (or stay) on board the content train, but it should also be rewarding to your buyers. Form your content topics around answering customer questions, providing resources to prospects, and delivering industry information that might be useful to your audience. If you shift your content strategy to be all about providing value, you will gain it in return. Since start-ups are usually strapped for cash and time, they have to get scrappy with their PR initiatives and maximize everything they do to the nth degree. While you probably aren’t facing the same limitations, you can still apply this principle to attain success. Two of the best PR tools you can leverage are customer testimonials and case studies. After all, testimonials use your customers as your mouthpiece, and case studies present your business’ value propositions—backed up by proof of historical success and data. Both are powerful. Forrester Research recently found that buyers will independently find three pieces of content about a company for every one piece that is put out by its sales or marketing departments. This means that the more third-party, fact-based content you can initiate, the better the odds that prospects will stumble across flattering (and convincing) views of your company. If you’re lacking in testimonials and case studies, step one is to start gathering them. Once you have as many of each as you can put together, it’s time to strategically approach how to share them. You can get a lot of runway out of case studies by posting them on your website or including them in email marketing messages, on landing pages, in social media, as part of a speaking proposal or award submission, and beyond. Real success from real customers can—and should—be used ad infinitum by companies of all sizes. There are two more prongs of PR that your business might want to consider tackling from a lean standpoint: speaking opportunities and awards. If you have a large company with some notable C-level executives, you might have no problem securing speaking engagements. Your top dogs may even be offered payment in exchange for presenting at certain events. But if you’re not quite at that point, you may notice that speaking sessions are trending towards a pay-for-play model. Before committing to exhibit at an event, simply so you can get your VP a speaking slot, do some research. Is this event really comprised of your target audience? Does it make mathematical sense to pay sponsorship fees, based on the number of qualified leads you can expect to walk away with? Just because you have the cash doesn’t mean you should spend it. The same thought process applies to awards programs. As companies grow, it’s easy to get swept up in a “keeping-up-with-the-Joneses” (business edition) mentality. Maybe your competitor has eight awards that validate its software, but you only have three. Don’t fall prey to the comparison game! Instead, thoroughly vet each award program to determine if the end result helps accomplish your goals, so you can decide whether or not it’s worth the cost to apply. Many will not be, and you can afford to be selective about which ones get your dough (and your company’s presence). 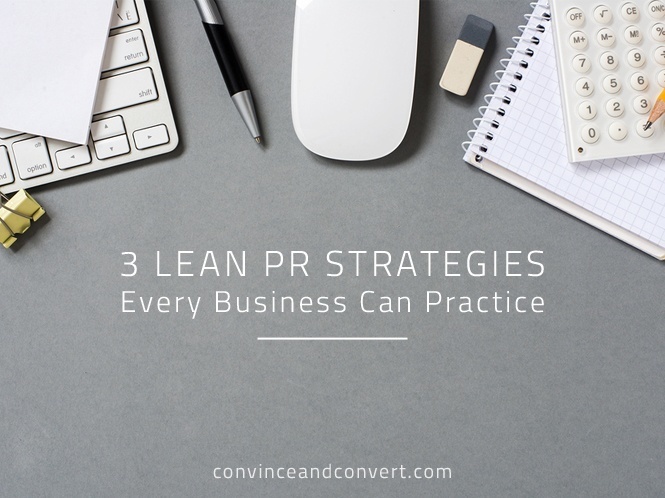 As you move forward along the ever-evolving journey of improving your business, take a little time to look at your PR strategies and tactics in a new light. Even though circumstances may not necessitate that you “go lean,” you still could greatly benefit from embracing this approach. Every business of every size could stand to give more value, maximize customer stories and be extra discerning when it comes to speaking and awards. Who knows… Once you lose a little of the extra baggage you’ve picked up along the way, you might even notice a newfound swing in your business’ step! Rebecca Hasulak is the author & creator of DIY PR: Public Relations and Content Hacks for the Lean Start-up and the owner of Quotable PR & Content. Her baby girl and loved ones are the lights of her life. Connect with her at DIY-PublicRelations.com.